SETEX Schermuly textile computer GmbH, Mengerskirchen/Germany, a market leader in designing, manufacturing and implementing automation solutions for the textile dyeing and finishing market, and the company Halo, ERP-provider and specialist for customized solutions from fibre to product, announce to have entered into a strategical partnership. Industry leaders collaborate for a comprehensive system towards industry 4.0. The strategic alliance allows the teams from SETEX and Halo to put into practice a comprehensive solution for processing and finishing of textiles via integration of Inteos and OrgaTEX components. Clients, namely the vertical manufacturers with knitting or weaving departments, will be pleased of the benefits of the range of Inteos modules, deeply integrated into the OrgaTEX platform and working out of the box. The combination of Halo´s longstanding experience as provider of customized MES- and ERP-solutions and SETEX´s position as a market leader for textile automation solutions, ensures a maximum in competence for fully integrated textile manufacturing solutions. As a result, Industry 4.0 will become a reality at your company”, states Marcus Ott of Halo. 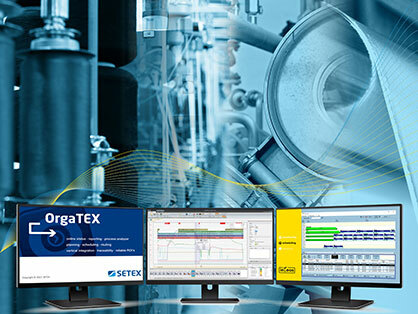 The new OrgaTEX-inteos solution enables SETEX to react adequate and flexible to different customer needs, and to offer one-stop complete solutions that meet the most specific individual requirements.